The Flash Pack came to Katté & Co as they needed to increase the number of enquiries for their adventure-seeking small group tour holidays. They'd dabbled with a bit of PPC themselves but struggled to reach its full potential. More or less starting from scratch (but gratefully tapping into the data the Flashpackers had been collecting previously) we built out multiple campaigns with multiple ad groups in order to target the full spectrum of search phrases that their target market were using. We focussed initially on the terms we could see had converted in the past but also spent a lot of time researching new keywords which we knew might be low volume but would have a much higher propensity to convert (and at a significantly lower CPA). 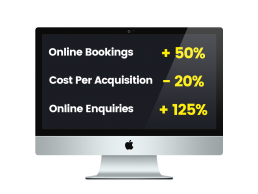 We also set them up with Call Tracking so we could better optimise the campaigns as we knew that half of their enquiries came over the phone. Coupled with some cleverly targeted remarketing ads we had little doubt the leads would roll in. Within 3 months it was clear to see the effect our campaigns have had. We have no historical data on phone calls (as phone tracking wasn't in place) but we've seen incredibly growth across all KPIs and are looking forward to even more success into 2016.